This high-quality part is designed to meet or exceed OEM specifications. Direct replacement for Whirlpool 482731, 4389140, 8537621, 4318001, 0056721, 0056801, 1100473, 1100474, 1100992, 1105608, 1105609, 14210061, 14218828, 14218831, 2154419, 2154977, 2169116, 2169143, 2631, 482470, 482731VP, 482733, 548697, 549420, 8112, 851170, 936162, 938117, 938149, 938287, 938292, 938296, 941547, 946653, 989687, AH376645, EA376645, FSP482731, PS376645, R0950025, Y0056721, Y0056801, AP3110929. 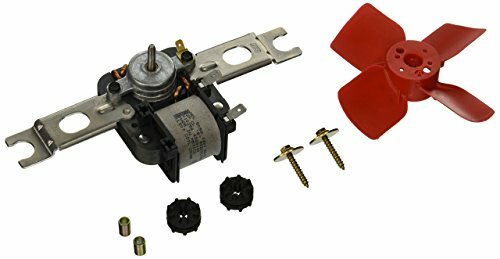 EVAPORATOR FAN MOTOR - This premium quality part is a direct replacement for Whirlpool 482731, 4389140, 8537621, 4318001, 0056721, 0056801, 1100473, 1100474, 1100992, 1105608, 1105609, 14210061. 14218828, 14218831, 2154419, 2154977, 2169116, 2169143, 2631, 482470, 482731VP, 482733, 548697, 549420, 8112, 851170, 936162, 938117, 938149, 938287, 938292, 938296, 941547, 946653, 989687. AH376645, EA376645, FSP482731, PS376645, R0950025, Y0056721, Y0056801, AP3110929. PREMIUM REPLACEMENT - Supco SM343 evaporator fan motor is designed to meet or exceed OEM specifications.